I realize that peaches may seem so last month to you, but if your kitchen is anything like mine they're still hanging around. 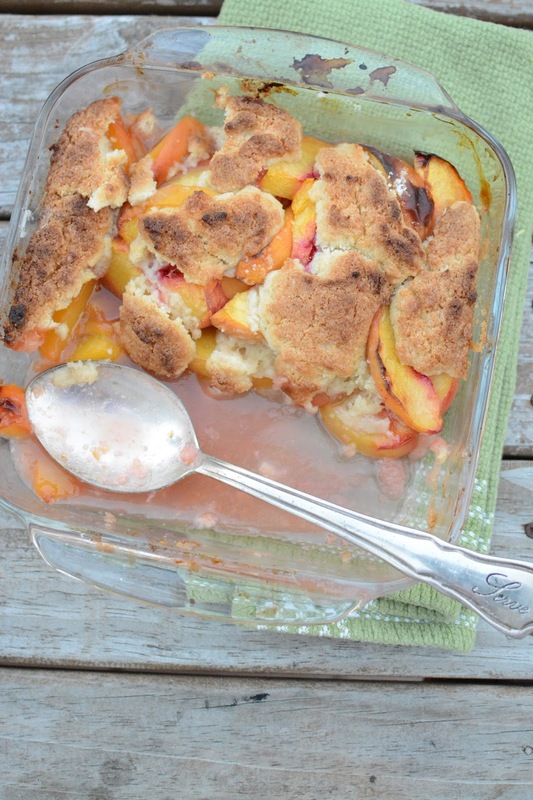 I have gone to skillet peach cobbler many times this summer but the other week I wanted something different- a more traditional take on the beloved dish. I searched my blog and I had made one in the past. The picture was small and all I did was link to the recipe. My how this blog has grown. I wanted to re-share it here and now so that you might enjoy the last tastes of summer before we really get crazy and eat all things pumpkin all the time. There isn't a problem with that in my book but until that time, here's a final hurrah to peaches. In a bowl or just in the 8x8 baking dish toss the peaches, sugar, lemon juice, and cornstarch. Bake in the middle of the oven for 10 minutes. Meanwhile stir together the flour, sugar, baking powder, and salt. Cut in the butter with a pastry cutter and then stir in the water until combined. Dollop the batter onto the warm peaches and then put back into the oven for 20-25 minutes until golden. Enjoy warm with ice cream of course.